Jewish cuisine is a diverse collection of cooking traditions of the Jewish people worldwide. 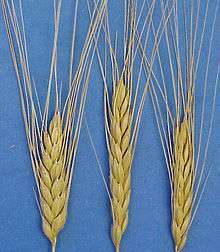 It has evolved over many centuries, shaped by Jewish dietary laws (kashrut), Jewish Festival, and Shabbat (Sabbath) traditions. Jewish cuisine is influenced by the economics, agriculture, and culinary traditions of the many countries where Jewish communities have settled and varies widely throughout the world. 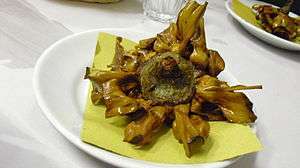 The distinctive styles in Jewish cuisine are Ashkenazi, Sephardi, Mizrahi, Persian, Yemenite, Indian, and Latin-American. 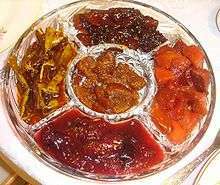 There are also dishes from Jewish communities from Ethiopia to Central Asia. Since the establishment of the State of Israel in 1948, and particularly since the late 1970s, a nascent Israeli "fusion cuisine" has developed. 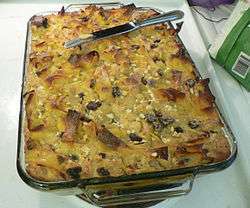 Jewish Israeli cuisine has especially adapted a multitude of elements, overlapping techniques and ingredients from many diaspora Jewish culinary traditions. Jewish cuisines vary widely depending on their regions of origin, but they tend to be broadly categorized into Sephardi (Iberian and North African), Mizrahi (Middle Eastern and Central Asian) and Ashkenazi (Eastern and Central European) families. Still, there is significant overlap, between the different cuisines, as Jews have often migrated great distances and as different regions where Jews have settled (e.g. Southeastern Europe) have been influenced by different cultures over time. 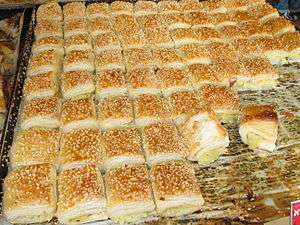 For example, Balkan Jewish cuisine contains both Ashkenazi / European and Sephardic-Turkish influences, as this part of Europe (up to the borders of present-day Austria and Poland) was for a time part of the Ottoman Empire. Since the rise of Ashkenazi Jewish migration to 19th-Century Palestine and the establishment of the State of Israel, increased contact between Ashkenazi, Sephardi, and Mizrahi Jews has led to a rising importance of Middle Eastern and Mediterranean cuisine amongst Jews of all ethnicities. 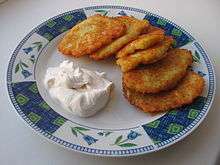 While Ashkenazi cuisine as it is known today is largely based within the context of American-Jewish and Ashkenazi-Israeli food, much of the culinary tradition of Ashkenazi Jews springs from Central,Eastern Europe. After having been expelled from Western Europe in the Middle Ages, Jews were forced to live in poverty and thus were limited in terms of ingredients. Dishes were made with fewer components; they weren't heavily spiced and ingredients that were more flavorful had to be used sparingly. 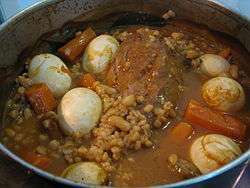 This is often why some dishes in Ashkenazic cuisine are known for being blander than dishes in Sephardic or Mizrahi cuisine. With kosher meat not always available, fish became an important staple of the Jewish diet. In Eastern Europe it was sometimes especially reserved for Shabbat. As fish is not considered meat in the same way that beef or poultry are, it can also be eaten with dairy products (although some Sephardim do not mix fish and dairy). Even though fish is parve, when they are served at the same meal, Orthodox Jews will eat them during separate courses, and wash (or replace) the dishes in between. 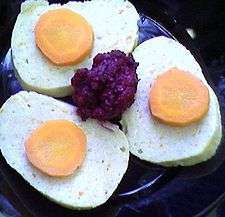 Gefilte fish and lox are popular in Ashkenazi cuisine. The combination of lox, smoked salmon, or whitefish with bagels and cream cheese is a traditional breakfast or brunch in American Jewish cuisine, made famous at New York City delicatessens. 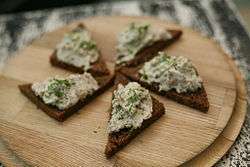 Vorschmack or gehakte hering (chopped herring), a popular appetizer on Shabbat, is made by chopping skinned, boned herrings with hard-boiled eggs, onions, apples, sugar, pepper, and a dash of vinegar. 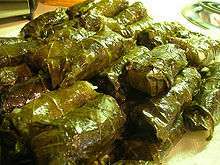 Holishkes, stuffed cabbage, also known as the cabbage roll, is also a European Jewish dish that emerged from more impoverished times for Jews. Because having a live cow was more valuable than to eat meat in the Middle Ages, Jews used fillers such as breadcrumbs and vegetables to mix with ground beef. This gave the effect of more meat that was stuffed into the cabbage leaves. Apples and honey—for a sweet year for Ashkenazi Jews, Sephardic Jews serve cooked or baked Apple. 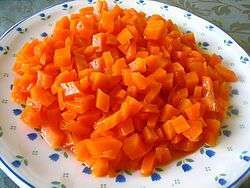 ↑ "BCK Kosher Certification Agency—Kosher Kitchen". Bckosher.org. Retrieved 2012-05-01. ↑ "cRc: Kosher in the Kitchen". Consumer Kosher. Chicago Rabbinical Council. Retrieved 2012-07-12. ↑ Lupovich, Howard (2010). "7". Jews and Judaism in World History. p. 258. ISBN 0-203-86197-3. ↑ Jay Rayner. "Enduring love | Food monthly | The Observer". Observer.guardian.co.uk. Retrieved 2012-05-01. 1 2 Roden, Claudia (1997). The Book of Jewish Food. pp. 22–24. ↑ Cooper, John (1993). Eat and Be Satisfied. pp. 15–16. ↑ Miller, J. Maxwell; Hayes, John H (1986). A History of Ancient Israel and Judah. Louisville, KY: Westminster John Knox Press. pp. 51–53. ISBN 0-664-21262-X. ↑ Hareuveni, Nogah (1980). Nature in Our Biblical Heritage. Israel: Neot Kedumim. ISBN 965-233-002-7. ↑ Cooper, John (1993). Eat and Be Satisfied. pp. 4–9. ↑ Marks, Gil (2010). Encyclopedia of Jewish Food. pp. 70–71. 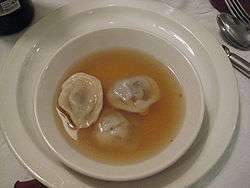 ↑ "Jewish penicillin definition". Medterms.Com. Medicine Net.Com, a WebMD Company. Retrieved 2012-07-12.